MASKerade: CASology 131 - Birthday! 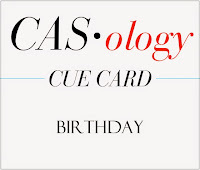 This week's CASology Cue Card is Birthday! In fact this week is my husband's birthday, so this challenge is very timely! For this one-layer card, I chose an MFT image (do you ever buy whole sets because you're in love with one stamp? This was the stamp in this set!) and a Simon sentiment. They work together because they both have a heavy, solid, square-ish portion (the all-cap HAPPY and the gifts) and also a lighter, curvier portion (the script birthday and the ribbons). Keeping all 'the action' in the bottom one-third of the card preserves white space and makes the card feel very clean. I finished it off with tiny pops of colour by using enamel dots. They add a festive feeling! Now it's your turn! Before you make your birthday card, make sure to check out the other DT members for more inspiration! Hey Ardyth!! I love all of those black gift boxes on your white card base. Those enamel dots are cute too! So pretty!! That is such a cool image and the enamel dots set it right off! Great card for your husband! Definitely an off-the-chart "WOW" factor! The nice chunk of white space sure does a great job of showcasing the gifts...and the sweet enamel dots! PS Happy Birthday to Michael! Ardyth, I love mixing stamp companies when they are similar -- the black, boxy images and sentiment are perfect together! Happy birthday to your DH! I love that little row of presents with the pops of colour, gorgeous! Such a fun design and I love the mix of pattern on the presents! Love those cute little enamel dots, too! Love the colourful pops of enamel dots on the black presents. I love your design and reading your explanations of why things worked, thank you! Such a fun card! Love the enamel dots! Awesome card Ardyth! I saw the curves in the bows and the "birthday" and then read your post...your card elements are always artistic and so well paired/put together! Love this birthday card! I love how all the colour on your card comes from those cleverly placed enamel dots. So small, but so effective! Am always so inspired by your ideas! fantasic card, love the look, a true eyecatcher for me! OH this is wonderful Ardyth! I want to go buy this set for that one stamp too! haha! The black presents with the dots of color are perfect!! Brilliant idea!! I don't have many coloured inks and always shy away from stamping images like this in black, so this has totally changed my mind. Thank you for the inspiration!! Wow, it's amazing what a punch some little enamel dots can give a card - fabulous! Happy birthday to your husband!! This is fabulous Ardyth. The crisp white with the row of black packages is perfect for a masculine card. Then your little pops of color make it festive too...love ti! Great fonts and colors, Ardyth! Love the pops of color on the black and white. Wow - very cute combination! The colored pop make it! Hope you hubby had a wonderful birthday. 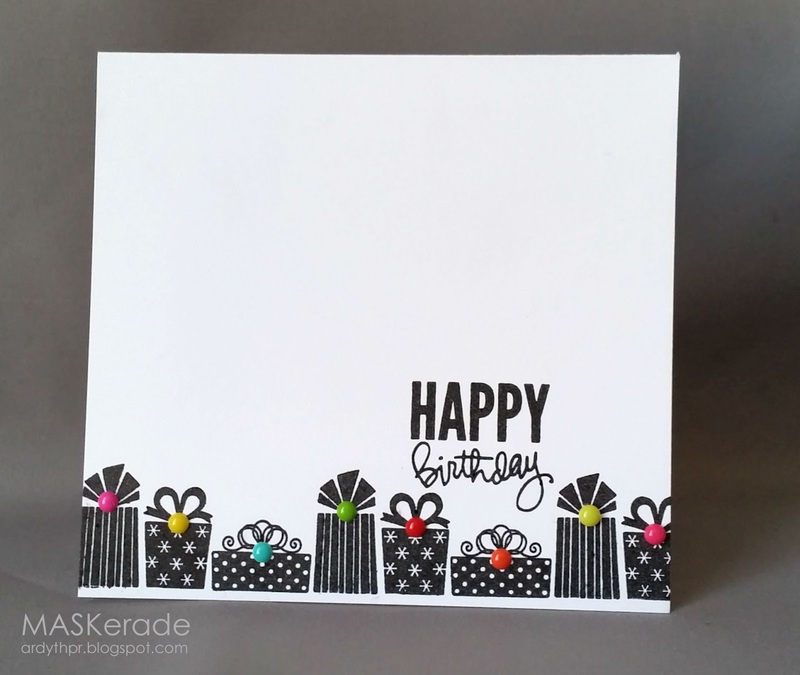 Your card is so festive and I love the black with the pop of bright colors on each package. So festive! Love the brightly colored dots against the white. Just so pretty!